Home › Promotions › Step into Fall with a new pair of boots! Step into Fall with a new pair of boots! Step into Fall with a New Pair of Boots! Bring in your old pair of boots and receive 20% off* a new pair. 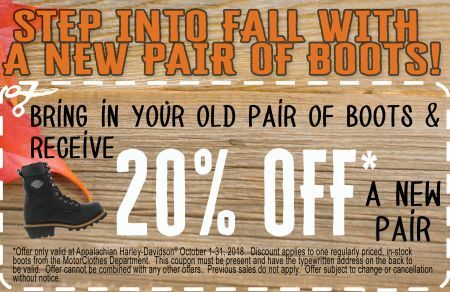 *Offer only valid at Appalachian Harley-Davidson® October 1-31, 2018. Discount applies to one regularly priced, in-stock boots from the MotorClothes Department. This coupon must be present and have the typewritten address on the back to be valid. Offer cannot be combined with any other offers. Previous sales do not apply. Offer subject to change or cancellation without notice.